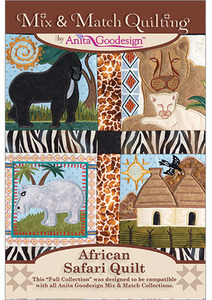 Multi-format Embroidery Design CD, African Safari Quilt /Full Mix & Match Collection/ 20 Blocks, 2 Transitional Blocks in 4 sizes each. have been reproduced in 20 different quilt blocks with vivid backgrounds. 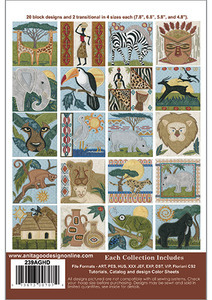 The designs all use applique so you can use your favorite fabrics to tell the story of your Safari! We also include border blocks to create your quilt.